Our fantastic Biomorphic-Shaped Hand-Blown Glass Terrarium makes "the" most perfect gift for the city-dwelling botanist. Our exceptional free-flowing terrarium planters were inspired by the organic shapes found in mid century modern Danish glass design. Highly decorative in form, these finely crafted glass terrarium planters create a relaxing and peaceful display. Our terrarium planters are fashioned from recycled glass by master glass blowers. Bubbles, dimples, rippling and natural flow marks add to the artisan appeal of these terrarium planters. Each vessel is unique and is made with at least 50% recycled glass content. Our terrarium planters are intended for indoor use only. Please note that pictured plants are not included (price is for the terrarium only). Each terrarium planter is hand crafted and hand formed by master artisans from recycled glass which is precisely the reason we like it. Each is a "one off" piece, entirely made by hand. Please note that due to this peculiar uniqueness, customer must be able to accept understandable variations in finish as well as minor imperfections that are normal for unique hand blown glass objects including irregularities, bubbles, dimples, flow and grit marks and rippling. Price is for 1 (one) terrarium planter. Select from three available sizes. 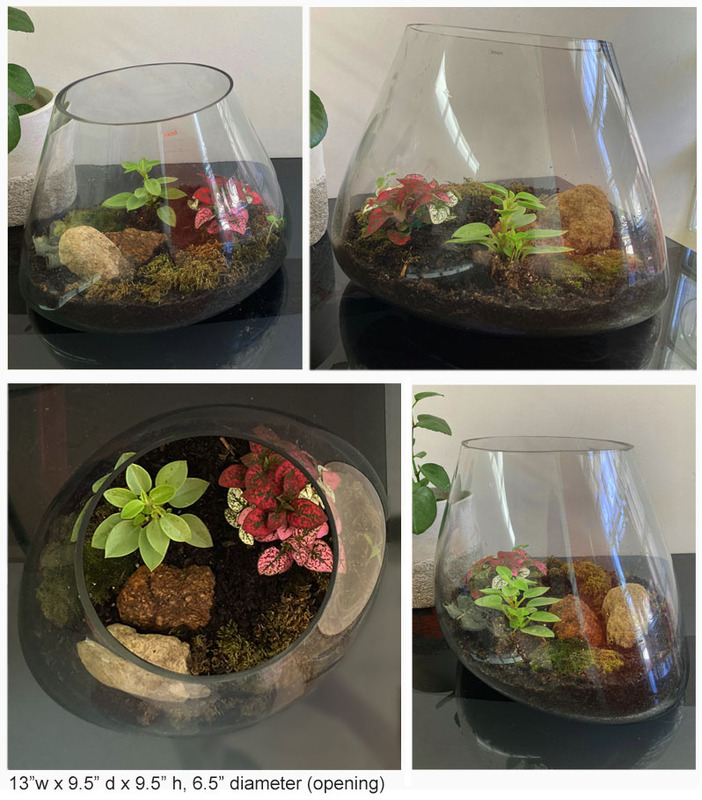 A small bonzai-sized terrarium is also available (see bottom page). Availability: In stock. Usually ships in 1 to 2 business days.